For the next guest post in my If I Were A Boy series, please say hello to Carolyn of Forever Scarlet. A finalist in the 2014 Blog Awards Ireland in the Best Beauty Blog category, Carolyn's passion for make-up and beauty gives a great spin on this subject. Read on to find out more! I’m very much a girlie girl. I like my dresses, skirts, high heels and makeup. I love shopping for a new outfit or buying items to add to my ever expanding beauty collection. However, as a girl, getting ready for the day or for a night out can be a little time consuming. Sometimes I find myself daydreaming about what it would be like to be a boy and how much time I would save if I didn’t have to do my hair and makeup every day. Over the 7 years that my boyfriend and I have been dating, I've slowly noticed that our styles are becoming more and more similar. There have been a couple of occasions where we accidentally dressed in the same style of jeans with a denim shirt, teamed with a quilted jacket. Queue one of us heading straight back up the stairs to hastily change into something else. When I was asked by Ian to create a post based around what I would wear, if I were a boy, I found myself veering towards things that my boyfriend would normally wear. When I was single, I was never really aware or cared too much about what a guy was dressed in, but now looking back I did have a certain type. 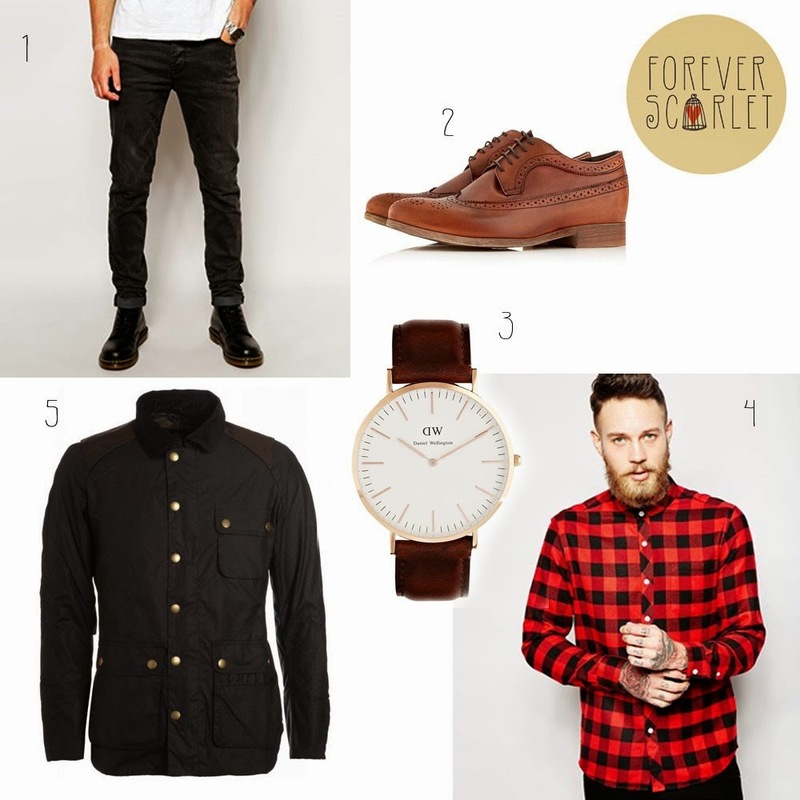 I like guys with a distinct indie look; a mixture of style conscious taste, but with an effortless edge. Alex Turner springs to mind when I think of the kind male style that I go for. For this post, I’ve kept it quite minimal and simplistic. I don’t tend to go over the top normally, so even if I were a boy, I think I would still stick to that style. 1. ASOS washed black jeans. 2. Topman brogues. 3. Daniel wellington watch 4. ASOS checked shirt. 5. Barbour jacket. 1. A good pair of black jeans is a must. I wear black jeans a lot and I don’t think I would change this if I were to swap gender. There’s not much more to be said here, black goes with everything and jeans are a wardrobe staple for both guys and gals! 2. Brogues of course. The smart/casual shoe that compliments any outfit. I couldn’t write a post for Ian without featuring a good strong pair of brogues. 3. A classic cool watch. I picked this Daniel Wellington style before I saw that Ian had already featured it in a previous post! Great minds. 4. Checked shirts never date. I have to admit that when selecting this I was looking more at the model than the shirt. If I were a man, I would definitely want to look like him. 5. Barbour jackets are the bomb-diggity. Expensive but worth the investment. I personally love the textured shoulders. There you have it, the items that I would opt for if I were to morph into a man. Thank you Ian for letting me be a part of your ‘If I were a boy’ series! Thank you again for taking part Carolyn! If any of my female readers would like to feature in the future, please drop me an email. All photos are owned by rogues+brogues unless stated. Powered by Blogger.